The Alliance for Science is the third in our series of resources to hook your students into subjects by way of imaginary organisations. The first, The Ministry of Maths is a look at maths questions from the perspective of the nefarious individuals who write maths tests - it's been used as end of key stage and SATs preparation as well as a hook to lure pupils into maths. Our second organisation, The League of Literacy are an altogether more respectable bunch, fighting crimes against the English language on the mean streets. It proved extremely popular as a way to teach grammar, punctuation and spelling in a lively way. The Alliance of Science are a secretive, elitist organisation who believe in keeping Science away from the masses. Long words and tricky concepts are to be kept away from the likes of your students. In fact, you could say they put the 'posh' in hyposhesis. As you'll be aware by now, at Sparky Teaching we like doing things differently. We hope that the Alliance's heady mix of secrecy and patronising language will be enough to get your students interested in learning key words, making tests fair and, possibly the greatest challenge to us, get them to enjoy the write-up! We also try to bash a few Science misconceptions along the way. As with The M Files and League of Literacy, we'd imagine most of our customers will be from KS2 teachers, but there's nothing stopping a sparky Secondary Science teacher using the concept to motivate their students. It all depends on your students willingness to "play along". In our experience, Upper KS2 love this sort of thing. The resource is a 37-page PDF as well as two video clips. The PDF includes lesson activity ideas, printable posters and reward certificates. The Alliance for Science costs £10.60 (approx $17). To purchase the resource, click the button below which will send you to a secure PayPal checkout. Once payment for the £10.60 (approx $17) has been accepted, click the link that tells to go back to Sparky Teaching (this bit's important!). You will be redirected to a page where you will be able to download the resource. We will also send you an e-mail containing a link to the download page. Remember to keep a copy of your receipt if you intend claiming the cost of your purchase from your school budget. 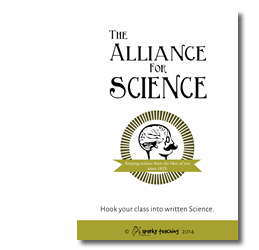 If you're a sparky-minded school and you want to place a bulk order, you might be better off getting The Outstanding Teaching Pack which includes The Alliance for Science (and the rest of our downloads) and is a ridiculously good offer! We can invoice your school directly. 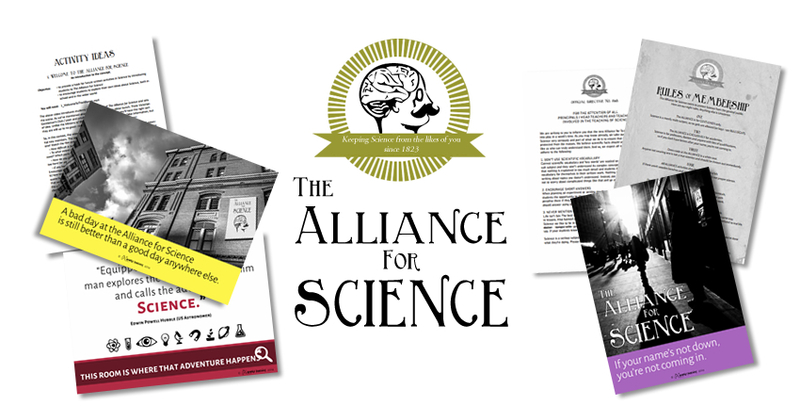 The Alliance for Science is an electronic resource. If you're a publisher and might be interested in seeing it in print, do get in touch. The Alliance for Science is copyright Sparky Teaching 2014.